The Hillsboro FFA general livestock judging team is back at it. So far the team has been to three judging events. At Mt. 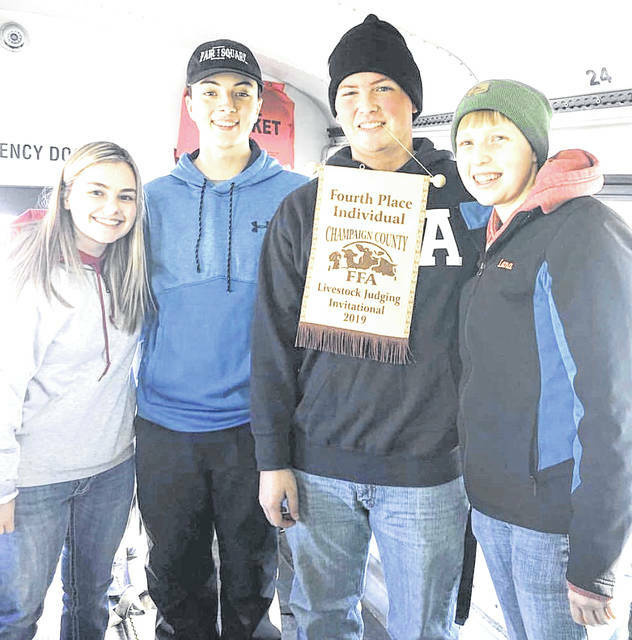 Gilead it placed sixth overall, at Marysville it placed eighth overall and member Joe Helterbrand was fourth overall in individual, and at the Wilmington Aggies student Lana Grover placed eighth overall individually. The event consists of judging and placing eight classes. The classes include two classes of beef, swine, goats and sheep. Four of the classes they judge then answer five questions. They then judge a keep cull class and complete a market grid. Team members include Lana Grover, Scottie Eastses, Kirsten Harp, Joe Helterbrand, Bryce Stanley, Gavin Puckett, Clara Page, Mallory Parsons and Kelcie Thornburgh. Pictured, from left, are Harp, Puckett, Helterbrand and Grover.